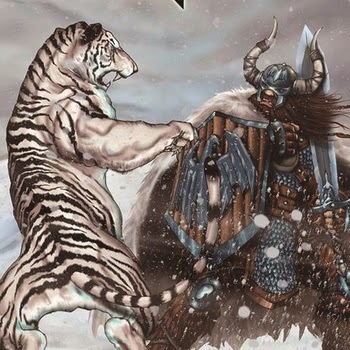 Peruvian heavy/speed metal band Blizzard Hunter was first formed in 2006. Originally conceived as a Ozzy Osbourne tribute band and going by the name of Blizzard (with the Hunter part added only recently due to trademark issues) the group eventually made the move from playing other artists material to performing their own. With guitarist Lucho Sanchez (ex-Disinter, ex-Necropsya, ex-Bleed of Hate) leading the way Blizzard Hunter entered the scene with their first release entitled "Demo 2011". At the time of the demo's release the group was fronted by vocalist Mauricio Medina, but (along with changes to the drummer position) that has now changed seeing as Sebastian "Dragon" Palma (Lightning, ex-Morvidhen) has firmly taken hold of the mic and made it all his own. From this point forward it would be foolish of Blizzard Hunter to make a change. Just as the change from Blizzard to Blizzard Hunter will help them in the long run (as there are far too many bands going by that moniker!) so will the addition of this high-caliber lead vocalist who brings a sense of magic to the mix! As for the rest of the band? Besides Sebastian "Dragon" Palma and the aforementioned Lucho Sanchez the current version of Blizzard Hunter includes guitarist Toño "Wild Rocker" Rojas De la Cuba, bassist Lalo "Indú" Salas and drummer Daniel Ruiz de Castilla. On "Conqueror Of Destiny" we are treated to the same three songs that made up the group's 2011 demo, but it's highly likely that in additional to there being a different, more improved line-up going on with those three tracks ("I'm On My Way", "Ghost Rider" and "The Joke") the new EP features upgrades in both sound and style! That's just a guess on my part, but seeing as strong as these three individual tracks are here on "Conqueror Of Destiny" it would make little to no sense that they were this good before. Why? Well, logic would follow that if the past versions of these three metal gems were this powerful and epic then this Lima-based outfit would already be signed and working on their second or third full-length LP! As a music critic one has to be careful to not toss around or overuse the term "perfect", but in this case Blizzard Hunter's new EP there is just no other way to go about it! For Peru's Blizzard Hunter it's a matter of taking what they most love most (80's speed metal, traditional heavy metal, N.W.O.B.H.M. and even early progressive power metal) and then, by way of a lightning bolt of energy and enthusiasm(! ), giving it a make-over so that the end result is an EP that finds all of those influential high-points loving nestled up to epic metal as well as both the European and American style of power metal. It really does end up sounding nothing short of glorious! And it most certainly makes Blizzard Hunter into a legitimate contender. There's little doubt that had this band come along in the eighties a release like "Conqueror Of Destiny" would be considered a classic. As it stands now it's a classic piece of recording and whether we choose to drag out American, European or Swedish bands to compare Blizzard Hunter to it would all end up being the same. These guys are great and "Conqueror Of Destiny" should make EVERY ONE'S best of 2014 list! This self-produced EP was recorded at Quarter Note Studios and it can be downloaded here: http://blizzardhunter.bandcamp.com/releases.Meanwhile there is also a tape version of "Conqueror Of Destiny" that can be pre-ordered at the link below. Due to be released by Sarlacc Productions it is limited to 100 copies, but as a collector's item in the making it is well worth acquiring! Either way though you can't go wrong with Blizzard Hunter and with a rumored album in store for later this year/possibly 2015 this is one band that I'm betting will pay off huge dividends for the label that signs them to a long-term deal!